Maybe you find interesting, as I certainly do, to read in the news that a new species has been discovered somewhere in the World. We recently witnessed the surprising and unusual finding of a new, beautiful monkey in Congo: the lesula (Cercopithecus lomamiensis), and you may also remember to read, even in the non-scientific press, about bizarre animal findings like the psychedelic frogfish (Histiophryne psychedelica) that lives in the Indonesian coral reefs. New taxa lovers would also probably know the top ten ranking of new species that is annually released by the International Institute for the Species Exploration, inspiring our admiration with the most surprising organisms that one could imagine. Reading the kind of news previously mentioned will probably yield to a biased conception of new species discovery as an event that only happens in exotic, inaccessible locations, such as the tropics and performed by professional biologists with enough funding and proved expertise. If you share this opinion, a recent paper published in PLoS ONE 1 is going to surprise you. A large number of researchers from different European institutions have joined to analyze real data about who and when discovered all the animal species recorded at the huge Fauna Europaea database (comprising more than 140.000 accessions). One of the basic objectives was to plot different cumulative curves of the number of species known to Science versus time since the very beginning: 1758, the date of publication of Linnaeus’ Systema Naturae, the starting point of biological taxonomy and nomenclature. A typical cumulative curve of this kind would show a pattern similar to the one we would find if we want to make a collection of the different euro coins, keeping them from our daily life. At first, most of the coins we can find will be new for our collection, and the curve would show a very steep slope. When the most common coins are already in the collection, it becomes gradually more difficult to find new ones, and the pace of our findings will slow down. If we continue our pursuit during a long time, the cumulative curve will reach an almost flat tail, when only by chance (or after a thorough search) a new, very rare coin, would be added to the count. The actual number of coin types would behave as an asymptotic limit if we want to model this kind of graph. Several sampling activities within Life Sciences show similar patterns and estimating the height of that asymptote is possible if we study to the shape of the curve. That is exactly what the authors did. Cumulative curves of valid animal European species.| Credit: Fontaine et al. The results turned out to be rather surprising. After centuries of taxonomic research, Europe is arguably the continent with the most studied fauna, but it seems that we are still far from having a complete idea of the zoological diversity of our continent. The cumulative curve for all the European species (fig. 1A) still keeps the steep slope that characterizes the early stages of biodiversity exploration without sign of depletion. Maybe Europe is not within the tropics, but it still harbors a massive amount of undiscovered species! Naturally, not all the different animal lineages show the same potential for species seekers. Some groups, like birds (fig. 1B) or dragonflies, are already very well sampled and their curves show the expected flat tail suggesting that very few (if any) new species will be discovered in Europe in the future. This is understandable: these are eye-catching animals, relatively easy to detect, and not especially diverse, compared with other organisms. On the other hand, beetles (fig. 1C), mites (fig. 1D) or freshwater fishes are just some of the many groups whose rate of new species discovery has remained constant, or even increased, during the last century. This not only means that biologists are not yet done with these animals, but also that getting close to the final figures will take a lot of research. Finally, other taxa like flatworms (fig. 1E) or lacewings and allies (fig. 1F) show more complex patterns caused by irregular or lacking taxonomical effort. The other main issue that the authors addressed was about who discovered the species. For this purpose they defined two categories of taxonomists: professional taxonomists (researchers, professors or graduate students who are paid for their taxonomic work) and non-professional, “amateurs” taxonomists, (who work in any other field and perform taxonomy during their leisure time). Interestingly, non-professional taxonomists have been responsible of a very significant portion of European zoological description during the 1998-2007 period and not just for charismatic, eye-catching animals, but also for inconspicuous invertebrates too (fig. 2). Fig. 2 New species described from Europe between 1998 and 2007 expressed as percentages. 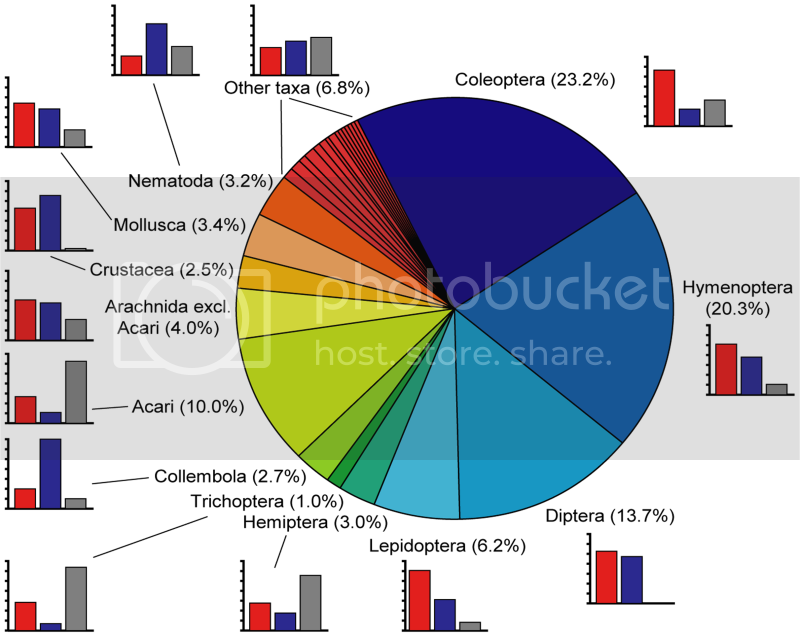 For each group, a histogram shows the percentage of species described by non-professional taxonomists (red), professional taxonomists (blue) and taxonomists whose status was unknown (grey). | Credit: Fontaine et al. In addition to the relevance of the results, I think this study should make us reconsider the clichés mentioned at the beginning of this post. It is not necessary to travel far away to bump into an undiscovered animal species: you can virtually do it on a daily basis, at your backyard, during a hike or the next time you go fishing. Of course, the tricky part is not just finding by chance an unnamed species, but being aware of it! Taxonomy is not an easy, straightforward task! Nevertheless, the remarkable contribution of amateur taxonomists along history should also encourage any potential biodiversity explorer: you do not need to travel to a rainforest or to a coral reef and you do not need to be a professional biologist; taxonomy will require a lot of patience, training and meticulous observation, but the truth is that joining one of the most gigantic challenges of the history of Science may be more accessible than people think. First of all I want to thank the people from Mapping ignorance for having the guts to start this enterprise. I wish you all the best!! Now, let’s go to the point…There is a big problem with the definition of the taxon specie; and when a biologist refers to a specific specie it is important to know which school of thought actually follows that biologist . I think that was Ernst Mayr the first one that pointed out, in 1942, in his great book “Systematics and the origin of species from the viewpoint of a zoologist”, that there are actually many different concepts of specie and what we can call a “specie problem”. Since then, this topic has been hot, indeed is not trivial, the debate is philosophical in nature. Like Mayr and Dobzhansky my opinion is that the best definition of specie is the “biological concept of specie” (Dobzhansky 1935), which defines species as members of populations that actually or potentially interbreed in nature, not according to similarity of appearance. Now, having saying that and going back to the topic, in my opinion the authors should tackle this issue. What kind of definition of specie are they using? or are they mixing everything? Regarding the headline of the article, I’m in complete disagreement. Perhaps is easy to define morphological specie, or perhaps typological specie but not phylogenetic or biological specie. The issue with the identification of the copepod Eurytemora affinis is a good example… I know that is only an example, but I think that is a good one. This copepod was first identified as morphological specie. Lee (2000) studied 38 populations through a philogenetic analysis using highly variable mtDNA markers, what he found is that between those populations the mtDNa sequences had a 10% of variation (16sRNA) and a 19% of variation (COI), that is to say, the divergence ratio was 2% per 1000000 years. Afterwards Lee realized that those populations do not hybridize between each other, those populations make up different cryptic species. Thank you again for the fantastic review of the paper!! !, I’m looking forward to read more from you!! Thank you very much for your feedback, and for your interesting comment. I am glad to expand the discussion of the articles. 1)	The rate of the description of European biodiversity has remained high during the past centuries, suggesting that we have not yet reached the flat end (i.e., that the new species to be discovered are not yet too rare, unusual or difficult to find). This was not intuitive at all, I would say. 2)	A significant amount of these discoveries were made by non-professionals. I did not expect that, either. …and none of them should be questioned if the “species problem” is claimed to be lacking in the methodology. The authors could not discuss about the use of any species concept because they did not produce any data, they simply analyzed the data of Fauna Europaea, which is supposed to represent a fairly updated source of the current taxonomical knowledge. The species concepts used in F.E. are obviously various, as various are the concepts used by the specialists that described the species. Morphospecies concept may be guessed to be dominant, especially among the oldest taxa, but recent revisions based on molecular phylogenetics are also being updated there. Fauna Europaea is, simply put, the best kind of source we can use. Of course, this is constantly being changed and updated (with studies like the one you mentioned), but this will always be like that, because species are always working hypotheses, regardless your favorite concept. The authors did use the best available data. With the headline I try to underline that we bump into species that are unknown for Science much more often than we think. We just are not aware of it. It is indeed possible that in your next hike some of the beetles or fungi you find are unknown, and yet totally accessible. Of course that does not constitute a straightforward discovery process, but there are more good news: even without being a professional taxonomist, you can potentially do it: many amateurs have been successfully at developing these kind of skills with patience and practice, and I thought that this fact should be enough to encourage the potentially interested people. That is why I said “easier than you think” (in contrast to the clichés mentioned in the post). Discussing the species question as a result of this paper would be an off-topic, fascinating and tempting, I agree, but off-topic. The really relevant question that you arise is whether the phenomenon of cryptic species would be so sound that it could change the trend described in the paper. So far, it actually seems that we are underestimating biodiversity due to cryptic species (1; 2), so anyway, the statements of the authors would get even more sense. P.S. I do enjoy discussions on the species question, but sincerely, that is such a major issue that would make the topics addressed in the paper shrink. I am open to talk about it elsewhere. If you are interested, I summarized my points of view here. This is pretty shocking to me. Fig1A is basically what I will expect for rain forest areas but not for Europe. Beetles are comparatively big animals -in contrast to acari-, so it surprises me the current rate in the new discoveries. I wonder which percentage are european endemisms. Do you think that maybe a part of the new beetles are found in Europe but they are just carried in exotic imported goods like wood (or other ways)? I agree: I found these results truly surprising. Beetles can be very small too, but anyway, I would say this part is not very surprising, since Coleoptera constitutes the most diverse group in the whole biosphere (so far). I have no idea on the impact that exotic beetles may have, but I would say they are not significant in the overall figures. What I found really intriguing is that they found a similar rate among a group of vertebrates: freswater fishes! Anyone wants to go fishing? Yep, next time I go to the fish market I will bring a Fauna Europeae database with me XD . You never know!! !